HOBART: Australian Latvian journalist Peter Greste reported on Afghanistan, Somalia and Egypt for three decades for the BBC and Al Jazeera since 2011. 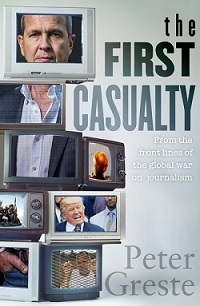 He dedicates his memoir to 1,528 journalists killed while reporting about global events between 9/11 and July 2017 including his own BBC producer Kate Peyton in 2005, Daniel Pearl in 2002, and James Foley and Steven Sotloff a decade later. Greste describes how his own reporting from Afghanistan changed with the war on terror. In 1995, he easily interviewed Taliban commanders for the BBC – the commanders then claimed to respect the BBC’s work and wanted to be taken seriously by Western media as aspiring leaders for their country. The murder of six Western journalists in Surobi, near Kabal, in 2001 became a turning point “when the Taliban came to see journalists as representatives of a world they had rejected.” With cultures at war, any prospect of dialogue had vanished. A predominant theme for Greste is providing his global audience with a deeper understanding of the political complexities of distant places like Afghanistan or Egypt. Even while in prison in Egypt, he found stories to report, including interviews with senior representatives of the Muslim Brotherhood and members of the April 6 Youth Movement, exploring links to Poland’s Solidarity movement. Perhaps the most moving aspect of The First Casualty is Greste’s empathy and gratitude for fellow prisoners – families of Egyptian prisoners bringing food that was shared by all and prisoners making room for new arrivals while translating and sharing their stories. One prisoner, Alaa, grew up in a politically active family with a history of imprisonment. Trained as a software coder, he developed open-source programs that support freedom of expression and protect digital privacy and launched Arabic news aggregation websites. He assured Greste that their imprisonment was not personal, but “about intimidating every journalist working in Egypt, whether foreign or local.” Poverty meant that guards felt trapped, too. One guard, Abdulah, cried after Greste received a sentence of seven years. Another, Abdul-Saeed, was obviously “underpaid with holes in his shoes and smelling as if he cannot afford soap.” Greste credits his daily practice of Vipassana, an ancient form of Buddhist meditation from India, for his compassion and endurance. Likewise, his parents and two brothers traveled to Cairo for his hearings and set up support networks to win his freedom. Greste repeats a warning from George Orwell’s 1946 essay “Politics and the English Language” – that “lazy writing repeats political phrases that hide more than they reveal.” For Greste, the job of journalists is to reveal the hidden agendas of politicians and speak truth to power. He acknowledges that “trust in the media is at an all-time low,” but insists that the media and democracy cannot survive without this trust. A solution, he suggests, is that the media focus on news, not on comment “in the hunt of advertising revenue.” Likewise, journalists must demonstrate solidarity with one another in the pursuit of truth. Leila Toiviainen grew up in Finland, trained as a nurse and midwife in England and received her PhD in philosophy from the University of Tasmania where she has worked for decades. For the past 25 years, she has been an editorial board member and contributor to the international Nursing Ethics journal and an active member of the Australian Association for Professional and Applied Ethics.